Keeping koi is an increasingly popular hobby and pond owners are quickly learning why the Japanese refer to this fish as the "jewels of the Orient." Called Nishikigoi in their native country, koi are brightly colored, active and seemingly friendly fish. Longtime koi keepers know a proficient feeding schedule is essential to the health and well-being of koi fish. Koi are beautifully animated fish who seem to enjoy interacting with humans, especially around feeding time. The problem with such exuberance at dinnertime is an increased risk of overfeeding. The formula koi specialists agree on is to feed fish as much as they can consume in three minutes. The idea is, if they are smaller fish, naturally they'll consume less in three minutes than larger fish will eat in three minutes -- all of them scarfing as much as their mouths will allow. The detriments associated with overfeeding koi can include a strained filter system, excessive bacterial buildup, increased carbon dioxide, decreased oxygen supply and an unhealthy abundance of fish waste. Symptoms of overfeeding koi can include cloudy water, surface foam, fish who are gasping and lethargic, fish with visible lesions, and death. Fish are genetically engineered to hunt and eat continuously. Koi hobbyists savvy to their fish's proclivity to eat overzealously may cut back on how much they feed -- but detriments of underfeeding koi, while not as plentiful as overfeeding, do exist. Underfed fish do not receive the nutrients necessary to stay healthy. The negative affects associated with underfeeding koi include growth stunts in young fish, infectious disease, malformed body parts, compromised immune systems and death. Some of the signs of underfeeding in koi include enlarged craniums, sunken eyes, kinked tail fins, poor color, inactivity and trailing white stool. A buildup of ammonia, nitrates and nitrites is the No. 1 reason for a failed koi pond habitat. These toxins are deadly to fish and must be immediately eliminated. Because they are the byproducts of fish excrement, overfed koi ponds are especially susceptible to rapid buildup. Stopping overfeeding and using a strong bio-filter will take care of this problem. Some koi keepers use fish pond vacuums. Vacuuming rids the water of waste, but water changes are still required. The most common technique to rid a koi pond of toxins is a substantial water change of at least 50 percent . 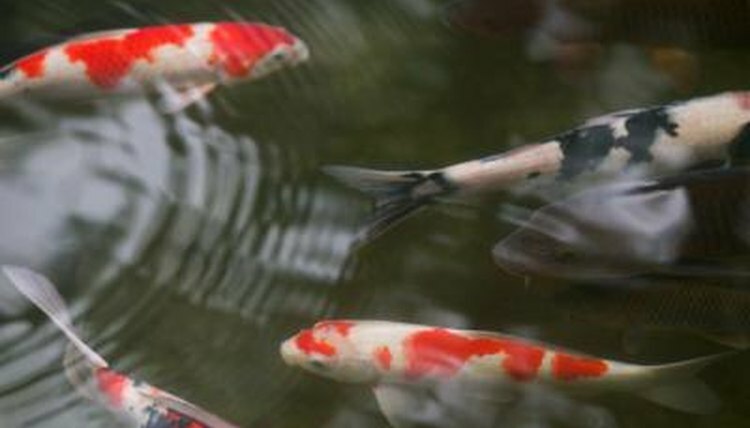 To meet koi's nutritional needs, experienced hobbyists rely on quality koi food pellets. These pellets need to contain probiotics to break down carbohydrates, fat and proteins. This formulated diet can be supplemented with treats such as fruits, vegetables or a high-quality dry dog food. Treats koi need for a balanced diet include a commercially provided freeze-dried krill and shrimp. If fruits and vegetables are offered, be sure to remove uneaten portions so the water quality won't be compromised. In cooler weather the feeding habits of koi will change. It is important to switch their primary diet pellets to a low-protein product and to cut back feeding to every other day.